Angelo John Santopolo comes to us from Houston, TX. 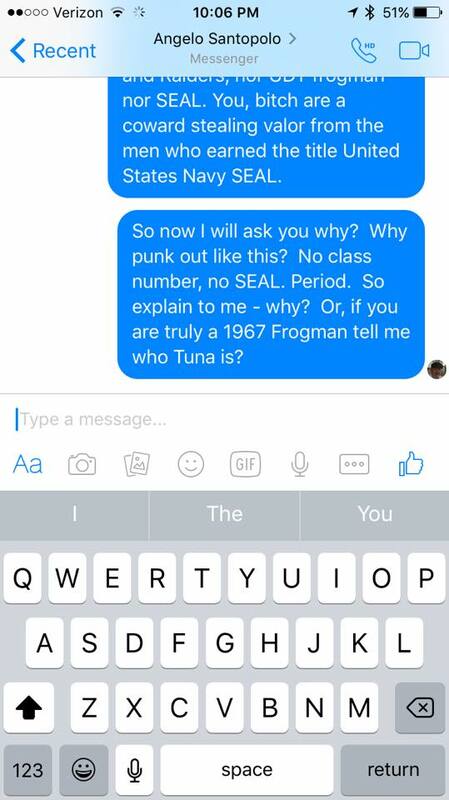 Military Phony’s became aware of Angelo a few years ago claiming to be a Navy SEAL. 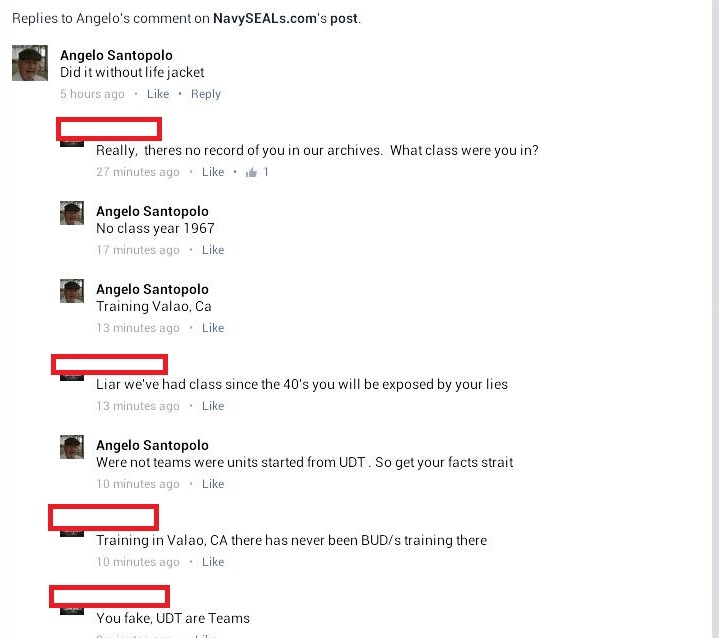 Angelo makes claims on Facebook at a Navy SEAL page (not official) how they did training different in his days. He is immediately called out by this author. 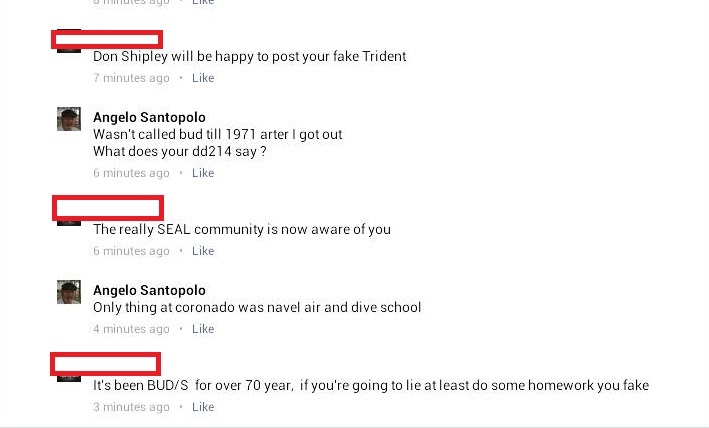 Angelo claims that he went through training in 1967 in Valao, CA and that there were no SEAL class numbers then. I will say BUD/S was called something different before the SEAL Teams but that was before 1967 and training was never in Valao, CA. 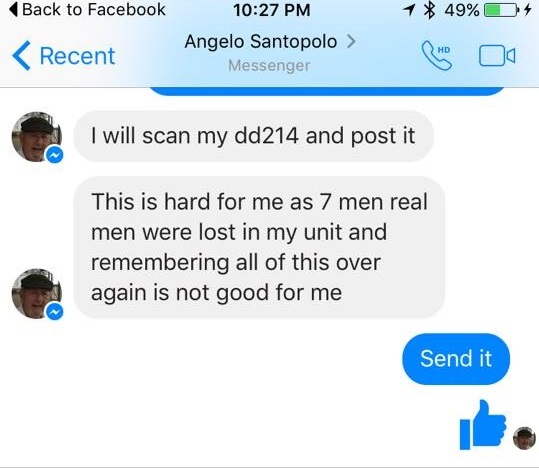 Another SEAL sent him a PM to Santopolo and pretended to be on his side and Angelo states he will provide his DD-214 and guess what?… he never did provide it. 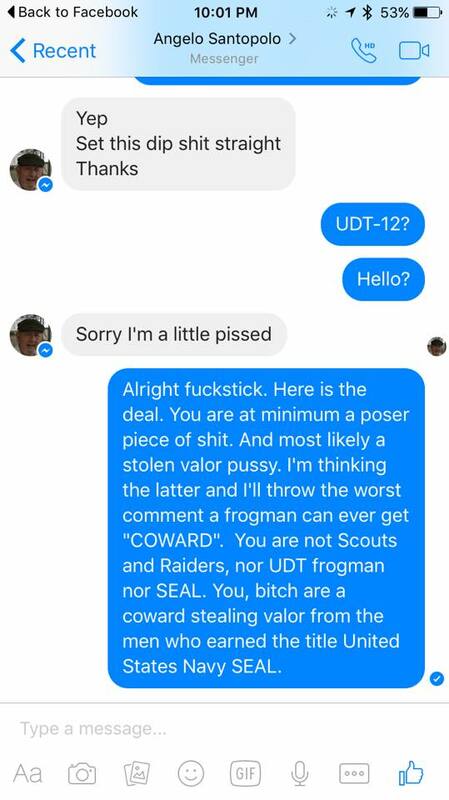 This turd will claim losing 7 men from his unit and he’s remembering it again. 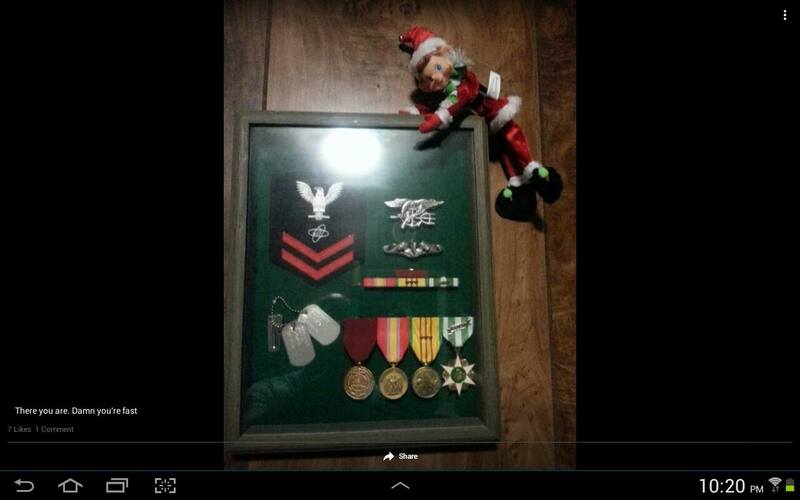 Then we visited his Facebook page and look what we found, a Navy SEAL Insignia in a homemade shadowbox. 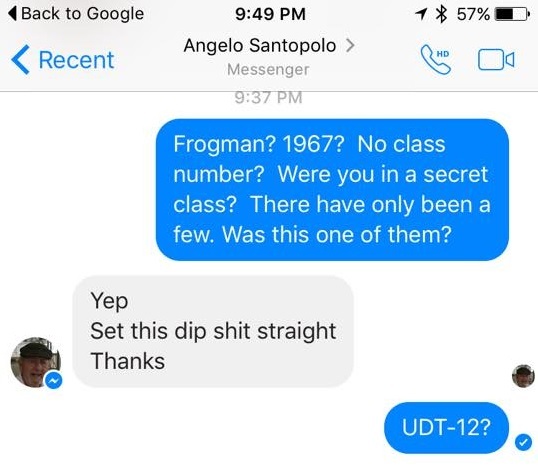 After contacting the UDT/SEAL archives, the Naval Special Warfare Center and checking the UDT/SEAL database we found that there is NO record of Angelo John Santopolo ever completing BUD/S Training or being assigned to a SEAL Team. 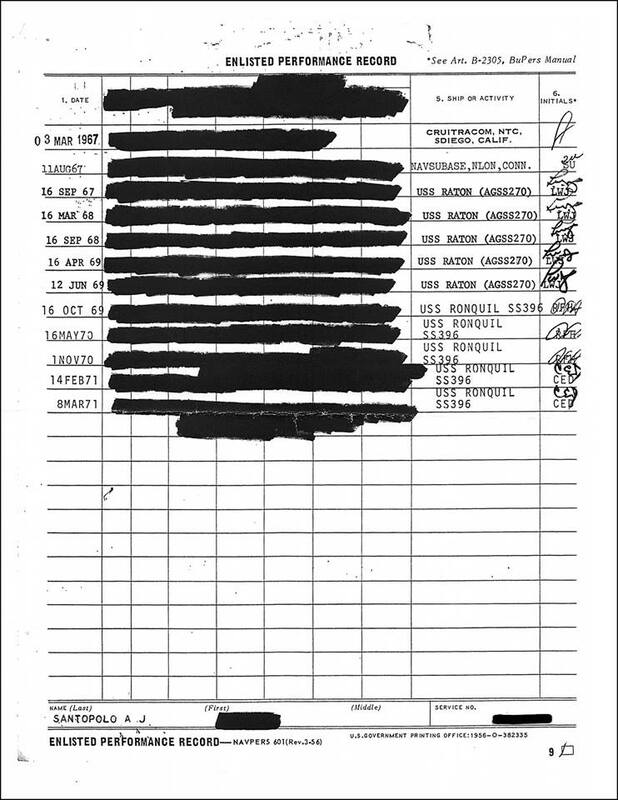 Angelo John Santopolo’s records were requested through a Freedom of Information Act (FOIA) request. 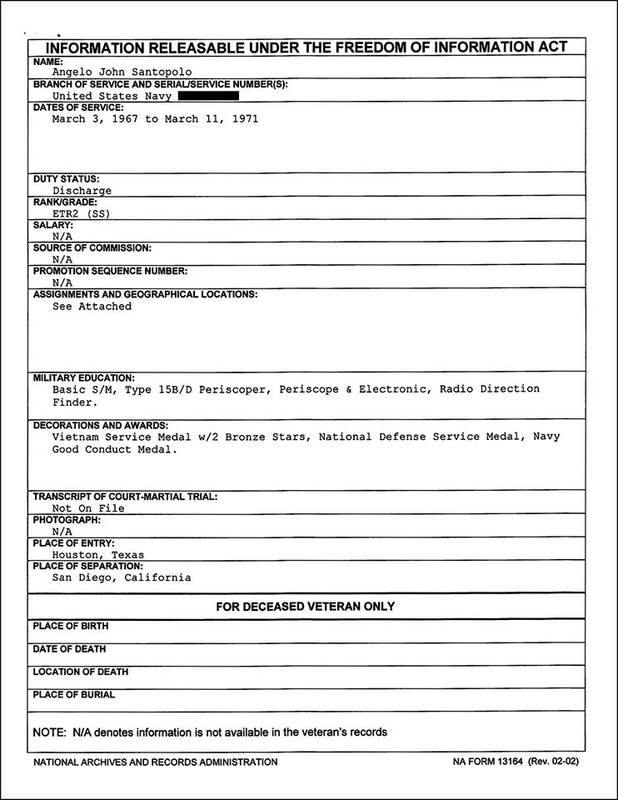 Based on Angelo’s summary Sheet shows that he did 4 years of active duty in the Navy. He was discharged as a ETR2 (SS), E-5 and did earn his Submarine Warfare insignia. There is no record of him attending BUD/S and NO SEAL Command. He can’t even get the name of the CA City right. I think that he means VALLEJO CA. There were a few subs Homeported there and of course the Home Yard for them would have been Mare Island Naval Shipyard, Vallejo Ca. Just sayin’! 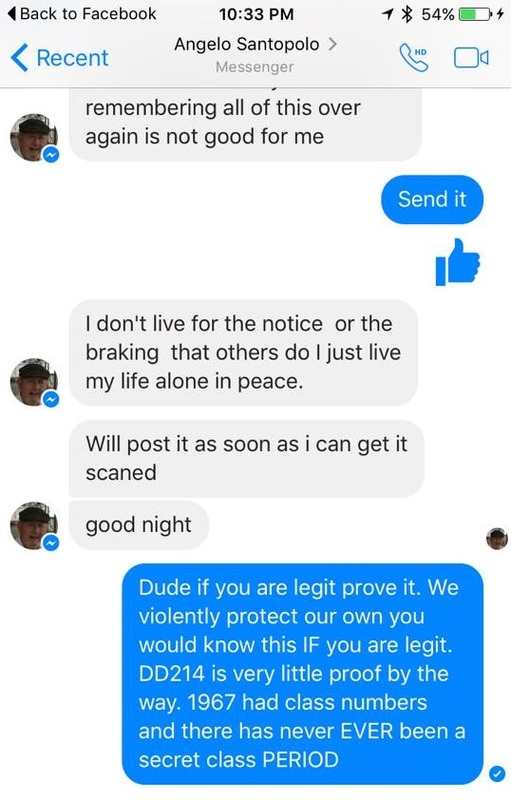 Guy did a good hitch in the Navy, nothing to be ashamed of. Why mess it all up over a lie? Too bad they feel the need to be someone they aren’t. 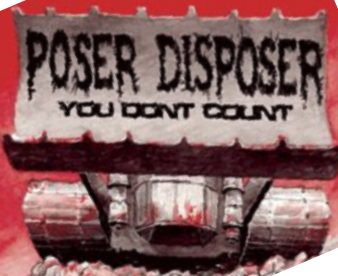 Oh come on – SEVEN guys in his unit were KILLED! He was one of them, that’s why you can’t find any info on him! Oh, come on! Seven men, real men, were lost in his unit. He was one of them, that’s why you can’t find anything on him!